Most of my knitting friends know me well. I rarely follow a pattern as written. Testing knitting, where you want to stay on task for the sake of the designer, is a personal challenge I also enjoy. My modification usually starts out as a mistake that I’ve just incorporated into the design. Or if I check the design’s finished projects on Ravelry, I might make some modifications based on recommendations or if I’m really adventurous, strike out on my own. Melinda VerMeer’s Nymphalidea in Deep Fall 2013 Knitty magazine fell into the last category of modifications. I loved Melinda’s use of gradient yarn and the simple pattern repeat. I didn’t care for the parallelogram shape, i.e., ripped it all out. I wanted a classic crescent-shaped shawl. It took a few missteps, until I realized that gradually increasing the lace wedge and decreasing the garter welts made a crescent shape. 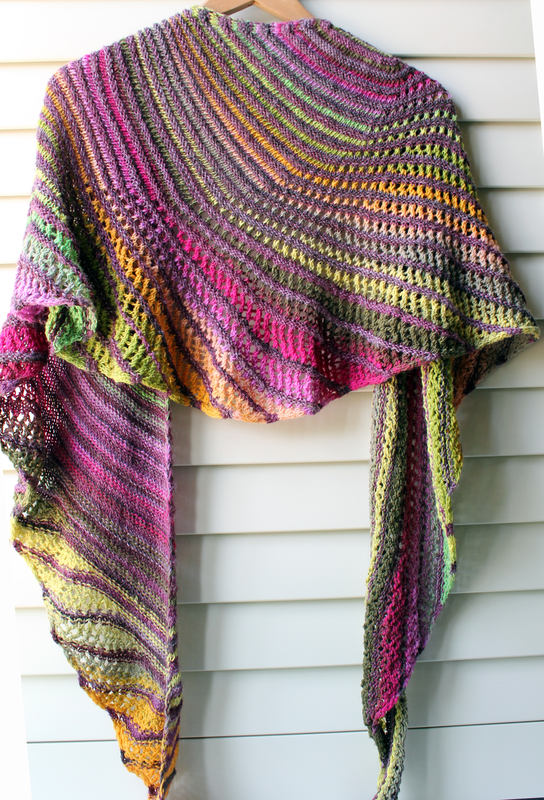 Melinda contacted several knitters who posted their modified versions of her Nymphalidea shawl design. I was included! Here’s a link to her blog post, Customizing patterns with 9 other knitters’ modifications. Kudos to Melinda encouraging us to use her designs as jumping off points. This entry was posted in Knitting and tagged Blog, Knit Designer, knitting, Modifications, Ravelry on July 1, 2014 by slantedstitches. I do remember you knitting this shawl. You did think back a lot but in the end you got what you wanted.